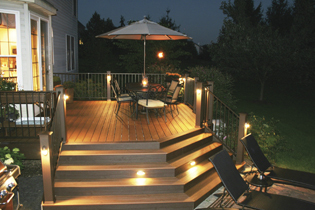 Surveying the wide variety of options is the first step in deciding how you’ll approach designing your outdoor space. Start by considering some of the top influences expected to dominate the outdoor living landscape this season. Retractable awnings. A retractable awning is a great option for adding shade to your back yard. With a shaded area, you can be more comfortable, enjoy outdoor dining and entertainment as well as protect yourself and your guests from direct sun damage. According to Trex Transend www.trex.com. Tropical staycation. Even in upstate New York, the look of the tropics will dominate as a top outdoor design scheme. 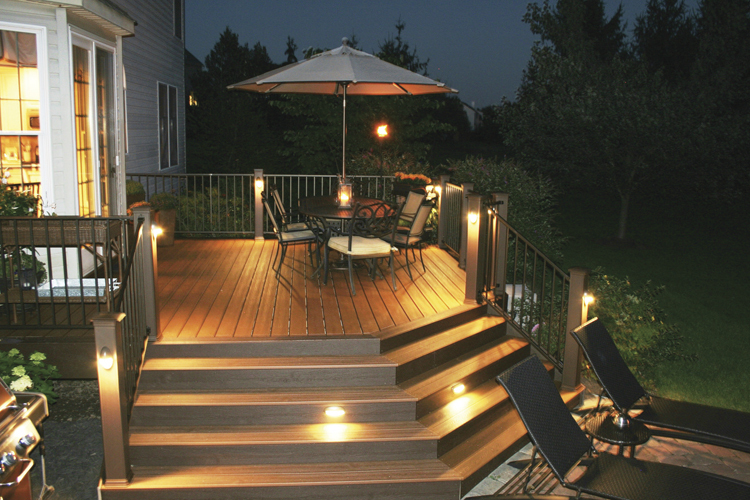 Materials that evoke the ambiance of an exotic island getaway are all the rage, from tiki torches, cabanas and waterfalls to deck boards featuring warm colors and multi-colored streaking inspired by tropical hardwoods are popular once again. With the entry of Pintrest in our lives as well as shows like P Allen Smith’s Garden Home on PBS, Backyard BBQ ideas are extravagant and gourmet. What fun it is to create an outdoor setting complete with modern twists on food preparation as well as state-of-the-art cooking methods. Sure, potato salad can be on the table but you can bet it has a unique contemporary look and guess what? It may even be healthy and low fat now. How about a grilled steak of your choice topped with a Golden Tomato Salad or Florentine Style with sautéed spinach done on the grill with slivers of garlic and spinach? On the stove in a skillet cook the diced onions, about 3 minutes. Take skillet off the stove and add whiskey (avoid all flames) and stir. Reduce by half, about 2 to 3 minutes Toss in Jalapenos and barbecue sauce. Bring skillet to the sliders or sliders to the skillet and simmer the sliders in the sauce until cooked throughout and bubbling. Spoon sauce on top of burgers and add some slaw. 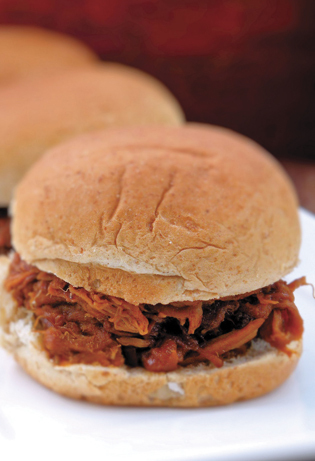 Sliders are big right now for home BBQ parties. The cherry tomatoes should be cut in half, then place in a large bowl, with shallot, capers, garlic, oil, and vinegar and mix. Cover and marinate at room temperature for at least 1 hour. Season with salt, pepper and herbs of your choice. Place a large cast iron skillet on the gas grill with about 2 tbls. of good olive oil. Quickly top slivered garlic into the hot oil and follow within seconds with 1 lb. spinach and 1 ½ cups of chicken or beef stock. This all cooks very quickly so keep on top of the spinach while cooking. Season with salt, pepper and fresh rosemary. In a mixing bowl, combine all the ingredients and toss gently so that the fruit is evenly coated with the cornstarch and sugar is mixed throughout. Place in a buttered cast iron dish or similar high-heat baking dish. 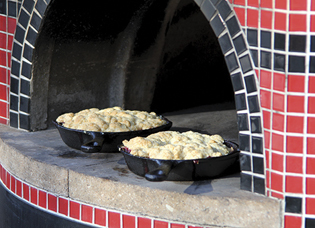 Evenly spread the cobbler dough over the top and place in the outside oven. Bake at 350 degrees for 35-40 minutes or until the cobbler dough is golden brown and the fruit juices are bubbling. Adding cornstarch to the fruit mixture will thicken the fruit juices. You can substitute flour for the cornstarch if desired; just ensure the cooking time is over 30 minutes allowing the flour to “cook” though so you do not have a grainy finish. In a mixing bowl combine flour, sugar, baking powder and salt. Cut the butter into small pieces and add to bowl. Using your hands or a fork “cut in” the butter until the butter is broken up to smaller pea size pieces. Add the cream and mix into all the ingredients are combines. Batter will be stick and small lumps are okay. Transfer homemade or store-bought pizza dough to a lightly floured pizza peel and stretch to re-shape if necessary. Oil the grill grates and decrease the heat to medium. Brush the dough with 1 to 2 teaspoons of olive oil and flip onto the hot grill. Close the lid on the grill and cook until the bottom of crust is golden brown, for 1 to 2 minutes. If you do have a pizza oven, how about this? Andouille sausage originated in France and was brought to the U.S. by German immigrants who settled in Louisiana. This smoked pork sausage is a staple of creole cooking and makes a great topping for pizza. If making your own sausage sounds like too much, one of my favorite versions that is readily available is D’Artagnan’s Andouille-Cajun style sausage. 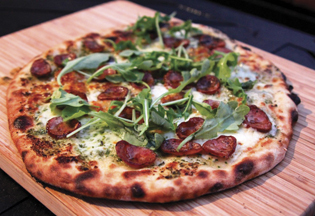 The sausage adds an intense kick of smoke and spicy paprika that is sure to enhance any pizza. In this version, basil pesto is used for the base in place of tomato sauce and it is topped with peppery arugula. After forming the pizza dough, spread the pesto evenly on the dough base and top with sliced Gruyere cheese. Scatter the andouille sausage over the top, place the dough in your outdoor oven or grill, until the crust is golden brown and the Gruyere is lightly caramelized. Remove the pizza from the oven and top with the arugula that has been tossed with a splash of extra virgin olive oil and lemon juice. Pound the garlic and salt, using a mortar and pestle, into a paste. Add toasted pine nuts and continue to pound. Once the mixture is a course paste, remove garlic pine nut mixture from mortar and place in a small mixing bowl. Chop the basil coarsely and add to the mortar. Pound the leaves to a paste. Return the pounded pine nut mixture to the basil, add parmesan, and continue to pound while adding the olive oil. Taste. Adjust seasoning as necessary. Rinse pork with cold water and pat dry. Set aside on a sheet pan or plate and season liberally on both sides with kosher salt and cracked black pepper. Best to let the meat temper to room temperature approximately 15-20 minutes prior to cooking. Similarly, once you have cooked the meat, let it rest for 2-3 minutes per pound to help retain juices. Slice the figs lengthwise in half. Place in a mixing bowl, season with salt, pepper and a touch of olive oil and balsamic vinegar. Once the grill is hot, place the pork and figs on the grill and cook for 7-9 minutes. Using tongs, make a quarter turn of the meat and figs and cook an additional 5 minutes. Flip both the pork and figs and continue to cook until desired doneness, about another 5 minutes for medium. Remove the pork and figs from grill and oven, let meat rest. 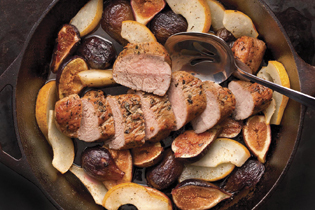 Slice the pork into medallions and serve with your favorite sauce and vegetable for an outside feast that is easy and healthy! 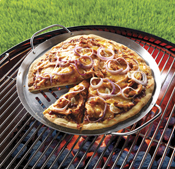 Slots expose pizza crust to heat, creating a rich smoky flavor and grill marks. Contact a local consultant through Pamperedchef.com. The PigTail® Food Flipper™ lightly pierces the edge of virtually any solid food. A quick flip and the food is turned over. Produced to exacting standards, it can pick-up anything including but not limited to: a whole rack of ribs, hot dogs, hamburgers, steak, chicken, bacon, shrimp, scallops, corn on the cob and much more. Visit www.jaccard.com. Perfect for grilling inside your pizza oven. Grill Bistecca Fiorintina, Chicken Diavolo and killer grilled vegetables. Heavy cast iron design absorbs heat for excellent grill marks. Locally available 901.468.3473. The Magic Opener is an easy-to-use bottle opener–a must-have tool for spring and summer parties and BBQs. Perfect in size for not getting lost outside and very practical. You cannot just eat, you must enjoy a beverage or two as well. www.magicopener.com. 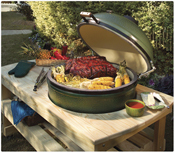 Widely acclaimed as the original American-designed ceramic cooker, the Big Green Egg was derived from an ancient clay cooking device known as a “kamado.” Originally a clay vessel with a lid, today’s EGG® is a modern ceramic marvel known for producing amazing culinary results for novices and experts alike for over thirty years! It is a grill, oven and smoker. Available at Adirondack Appliance, 67 West Avenue, Saratoga. www.adkappliance.com.